up in Disneyland? I saw him in Disneyland, Jesus Christ!" That's the problem with over-exposure. Terrified and outraged critics called for the celluloid negative of a certain movie to be destroyed, so harmful and morally repugnant they found it. Today it plays on a Sunday afternoon and everyone and their three-year old children think it's quaint. That was the original 1931 version of Frankenstein. Hans Rudi Giger's design and build of the very first alien from the 1979 classic sci-fi movie remains one of the true originals of horror movie characters. I visited – with a great amount of enthusiasm – the Giger museum in the Château St. Germain in Gruyeres, Switzerland and was roundly chastised by my family. It has an 'X' certificate – how many museums have 'X' certificates? The original alien suit was housed there and I cannot tell you how thrilling it was to stand and see it inches in front of me encased in glass. In the 1979 movie, Scott wisely offers a close up here, a rushed mid shot there. It's only in the closing moments when the awful majesty of its terror is blunted by the vastness of space, diminished by simple context. But stick that beastie around a darkened corridor and no nervous system is safe. Alien was the last film to truly terrify me and it's been stuck in my dreams and nightmares ever since. But the poor bugger's been so over-exposed, its horror crudely undercut and diluted by profit hungry folks in a few unworthy/worthy sequels (delete applicable) and crossover Predator nonsense. It still remains a design of pure genius but I think Scott is right in letting it stand down. Besides, Scott doesn't tend to repeat himself creatively. 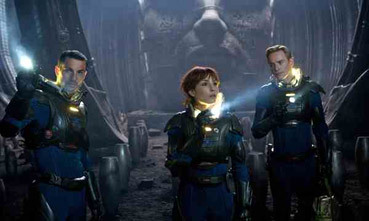 Also, unsurprisingly, Prometheus has been exquisitely marketed; its multiple teaser trailers had their own teasers! The TED 2023 talk by Peter Weyland (Guy Pearce) was a 21st century coup de web. And the steady leak of different trailer versions has stirred up a veritable frenzy of interest. I have the tiniest glimmer of my original anticipation I had when I was approaching my twenties and let me tell you... The tiniest glimmer of something that powered my every nerve ending thirty three years ago is strong stuff indeed. With a profound and respectful nod to Christopher Nolan's Dark Knight Rises (which I'm certain I'm going to adore), this was always going to be Prometheus' summer (sorry Joss and the gang but publicity for the big P started when I was 18. That's powerful mojo). Whether it scales the extraordinary box office heights of Whedon's Avengers is not important to me. But I do know that right now my anticipation and enthusiasm is reaching a critical point. I just know it'll look wonderful but it's still an expensive Hollywood movie that has to tick boxes. All I'm hoping for is a story that delivers on thirty-three years of knowing what a 'Space Jockey' looked like but not what it actually was. If Alien had any loose ends, it was that enormous creature that seemed moulded out of its seat. And what was that thing sticking out of it, a weapon? I guess, being front and centre in the teasers and trailers, we're about to find out. If any of you have seen Kate Bush's sublime video for her single Cloudbusting (starring Donald Sutherland), you may wonder if the Space Jockey's visual legacy has had subtle cultural reverberations. It defies rationality, how powerful this movie's gravitational pull actually is. It can be better understood if I tell you that to get this review out as early as possible, I'm going abroad to see it. The Dark Knight's never going to have that primal allure. I think if you've read this far and have an inkling of interest seeing this movie, you know the bare bones of the plot. "Oooh! Star maps found all over the world, cave paintings of humans in different times and cultures worshipping bigger versions of ourselves. It's an invitation..." Now then, have these people not seen Alien? It was a distress call? No. It was a warning. So probably not an invitation. Bring a bottle? How about bringing loads of bottle. Things may get nasty. You think? The trailers are master classes of their kind. And apart from some small things mutating into presumably larger things, a score heavily influenced by the 1979 movie's trailer, still horrendously effective and a glimpse at an alienesque ceiling design, that's about it for trailer hawk-eyes. So what's new and exciting and how can I comment on both without spoiling anything for anyone? Well firstly there's not a lot to spoil in terms of revelations. There are no "Aha!' moments in the movie, no narrative or character twists that all this secrecy sort of obliquely promised. And overall that is my broadest critique. If you've been following Internet speculation and scuttlebutt, you'll find that most theories are in the ballpark but again as I have written tediously often; it's not getting the answers but the journey that's the fun. Not sure fun is the right word. I was hoping for scary, exciting and a confident boldness of narrative. Almost three out of three. If I feel like commenting on specifics, I'll save them for the penultimate paragraph – consider that the spoiler part. I will give you fair notice. There is no doubt that Scott delivers big time with an emphasis on the 'big'. This is a huge movie with a solid (if not revelatory) science fiction script worthy of all the lavish attention the thousands in the crew have sweated over it. See it on the biggest screen you can find. Its epic nature will inevitably be diminished on the small screen. The CGI blends seamlessly with the real (and it was strongly reported that Scott attempted to shoot as much for real as possible). Alien (as in the simple noun) special effects attempt to blend physical and CG but it's very hard to take the CG 'otherness' out of some animation but that really doesn't come up as a problem. The mysterious 'Space Jockey' as he was called all those years ago, gets the slow drip feed of suspenseful reveal and it's no spoiler to remind you of the line in the trailer (and I'm paraphrasing) "...if that ship leaves there will be no more home to go back to." These 'Jockeys' (ironically twice the size of human beings as opposed to those half our size perched on horses) do not have our best interests at heart despite kick-starting us genetically in the first place. The reason why we are targeted to be wiped out when the self same creatures created us on Earth is never explained. Were we becoming a technological adversary? But in the end explanations are not really the point. I'm being kind. One or two explanations would have been uniquely satisfying. It may sound like a criticism but it's not meant to be but Prometheus isn't terrifying. Scary, maybe just a little but not Alien-terrifying. It's much more measured and ekes out its alien moments and gory spatter with a degree of reserve. There is nothing in this film I wouldn't happily let my 15 year-old see; hence the 15 certificate. There are edge of your seat moments and certainly tense sequences that get the heart racing. Shaw's 'operation' is a gem of close confined terror but her post-operative recovery was a little too swift for my taste. The production design is gorgeous with many an intended nod to the original Nostromo (which of course comes after the ship Prometheus in timeline terms). The exploring characters have video feeds that broadcast back to the ship (just like those in 1979) but while stylistically correct, it seemed odd to see degraded imagery. You'd think, given our present technology, the crew of Prometheus would have solved the video noise aspect that blights these images. There are sound effect quotations all through the movie as well as an original Jerry Goldsmith cue intertwined early into the soundtrack. The music by Mark Streitenfeld is suitably epic in the two instances we are allowed to go huge in thematic scope. Alas, the cues for the bulk of the film passed by as scores often do these days, in a welter of cutting edge but hugely invasive sound effects. Dialogue was also hard to catch a number of times, something I find very irritating. As I was in Holland, my Dutch friend got all the dialogue because it's literally spelled out for Dutch audiences. I sometimes had to ask him who said what. Despite ex-original Dragon Tattoo star Naomi Rapace's spirited and sympathetic turn as Elizabeth Shaw, the scientist whose work sends the team out to the stars, it's two other actors in particular who stand out. This is probably more to do with the characters they are playing, as is often the case. There's Michael Fassbinder as the humanoid robot David (each robot in the Alien series is named in alphabetical order – Ash, Bishop, Call and David). He has another agenda very different from the poor schmucks who are lining up to die gruesome deaths. It's tough to follow Ian Holm's defining role as Ash but Fassbinder brings enough of Holm's manner to the part while imbuing it with a distinct Aryan presence that is suitably creepy and at times formally unemotional. His line "I didn't know you had it in you." is the stand out piece of sub-textural dialogue in the movie. The first ten minutes on board ship are almost all Fassbinder keeping everything ticking over. It's hard for actors to pull off synthetic but Fassbinder is always convincing. The other character is of course Janek the pilot played by one of the most physically dynamic actors I've seen in a long while. Idris Elba will be well known to The Wire and Luther fans but Prometheus allows him some humour and his presence on the ship is always reassuring. He's got a face and manner that makes it almost impossible for him to hit an unconvincing note. It's also nice to see that Luther's habit of always touching his face in the TV series is a character trait not Mr. Elba's own bit of business. The rest of the cast are perfectly good in their roles with a nod to the glacial Charlize Theron whose mission this is. The Internet is abuzz right now with the 'twist' about her character. There really isn't one and if there was, my friend twigged it early. It's hardly a revelation worth worrying about. Sean Harris as the recalcitrant Scottish geologist Fifield gets the laughs but he's not laughing too hard himself by the close of play. I don't think it's a spoiler to note that a few folks don't make it to the final reel. In trying to distance themselves from Giger's original and now too familiar alien design, the filmmakers come up with a variety of alien forms all of which feel more like variations on The Thing than Alien. Nothing wrong with that except that generic beasties are ten-a-penny these days. Designer Neville Page has made a career out of dreaming them up (Cloverfield, Super 8). In the alien universe, we want beautiful and terrible all rolled into one. Having said that, the Space Jockeys are perfect; humanoid but powerfully alien and in keeping with Giger's original design. The aliens are less so. The sets are just gorgeous and I applaud Scott's decision to keep green screen at a minimum. Rapace said she was moved to tears entering the Pinewood 'big head' set for the first time. There is never any question where the budget went and as someone said to me in 1980 "You could do a lot worse with 11 million dollars than make Alien." But what you could do, once all's done, is either make it a prequel and lead up to Alien or break it away completely. Prometheus does neither frustratingly and that leads us to the afore mentioned penultimate paragraph – all in italics so you can 'fast forward' if you don't want to have anything revealed. Last chance. I'm going to be deliberately vague about certain aspects of the film but the movie did throw up some questions that I want to share. These are not spoilers per se but I do reveal moments that you may want to keep as surprises. If Prometheus is a prequel of Alien then the knot between the two doesn't tie neatly and that has to be deliberate. Shaw says that a warning must be sent to alert any other passing ships to keep a wide berth. If this is the warning intercepted by the Nostromo, why is it vaguely translated as a distress call? It's not as if Shaw would send out the warning in Welsh. Swedish maybe? The Space Jockey's ship, the beautiful Giger design, ends up on the planet ready for the Nostromo crew to find but the only explanation for the disparity of the planet location is that it must have been a different ship on a different planet. The dead Space Jockey in Alien, the poor bugger with a chestburster wound, is definitely not in that position in the crashed ship of Prometheus – so different planet, another identical ship? At the very end of the film, we get a familiar alien scene as a coda to push the film towards Alien so why is the revealed creature absolutely nothing like the chestburster in its stage of development? And what would any Alien movie be without rampant stupidity? In the original, the crew with IQs descending by the yard decide to look for the facehugger without putting the lights on – remember that? Hey, let's use a pokey stick with a tiny light on the end. That still bugs me. Well, Prometheus keeps up the tradition. Just because the air is breathable, doesn't mean you should breathe it! You're on an alien planet, people! And if an alien on a stalk (no spoiler as it's in one of the trailers) is facing you emerging from genetic goo, do not approach it as you would a sheep dog. Wonderfully and fatally idiotic! OK, that wasn't too revealing, was it? You're sort of guaranteed to see certain variations on the Alien shtick in Prometheus. So to sum up... Prometheus is a cracking science fiction yarn with some wonderful visuals, some terrific performances and a story light on explanation but perfectly entertaining in and of itself. I'm looking forward to a second viewing this weekend so that's praise of a sort. It's just neither terrifying (perhaps it's my age) nor as revelatory as I'd like. It's definitely recommended but not as highly as I'd hoped (I saw that sentence coming light years off). Oh, and I totally forgot I was watching a 3D movie. Is that what they call immersion?